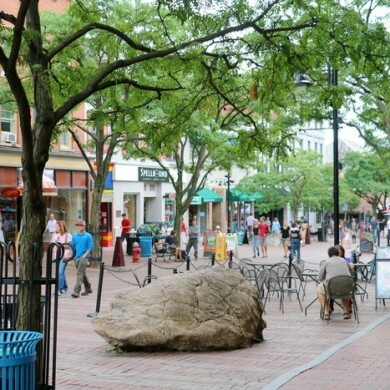 Make a day out of your visit to Church Street Marketplace and Waterfront Park in Burlington. Although it’s nearly 2 hours from Killington Mountain Lodge, the experience is well worth the drive. Burlington is the largest town in the state of Vermont, and also its cultural center. The marketplace is one long, cobblestone street – closed off to vehicular traffic so you can stroll from store to store, sample the local cuisine, drink a craft beer (or two), and peruse the art galleries and jewelers. Colored lights are strung together at the intersections, coming together to a point in the middle of the marketplace, like an open-air, glittery tent. It’s a wonderland for the senses, a fantastic place to taste and touch the real Vermont. Here, there’s a mishmash of big brands and unique boutiques. And of the latter: Danforth Pewter, Saratoga Olive Oil, Vermont Farm Tables … and various coffee shops, airstream food trailers and local eateries. Pricing is on the high end. In one such store, an apron was going for $75, and a single barstool for $400. Restaurant options range from pubs to fine dining. Many spots offer outdoor seating on the sidewalk, with large umbrellas for cover. We ate at a restaurant called Sweetwaters that has been in business since the 1980s – in a building that’s been around since the 1880s. The original site of the Burlington Trust Company (a big local bank), you’ll see remnants and reminders of its historical architecture in the restaurant’s molding and cornerstones. A large door emblazoned with the bank’s name now stands between the ladies’ and gentlemen’s restrooms. It’s consistently voted the best place to dine outdoors in Burlington, for its large outdoor patio, as well as enclosed patio dining to provide a year-round ‘outside seating’ feel. In fact, Sweetwaters – part of the Vermont Food Network – was the place that paved the way in petitioning the city to allow restaurants to have outdoor seating in the summer months, now a hallmark of Church Street. The bar is full, the beers are local, the menu is extensive. 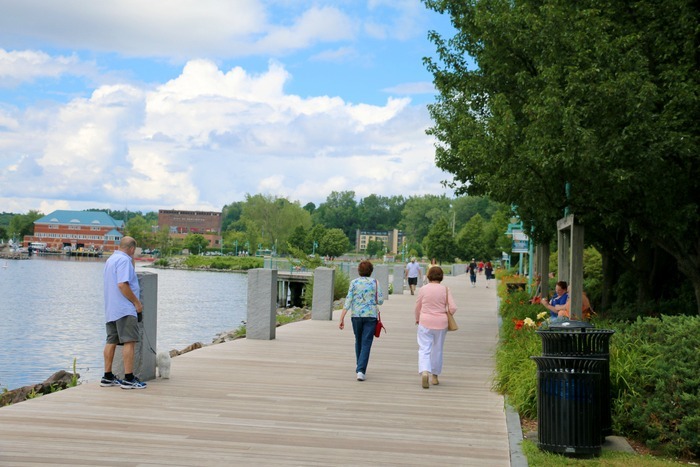 A short stroll from the marketplace, you can find the Waterfront Park. (Although you can actually view Lake Champlain from the marketplace – it’s that big.) Here, you can take a lakefront turn on the boardwalk or relax in a porch swing. There are also large rock formations and grassy areas for waterfront wasting the day away. 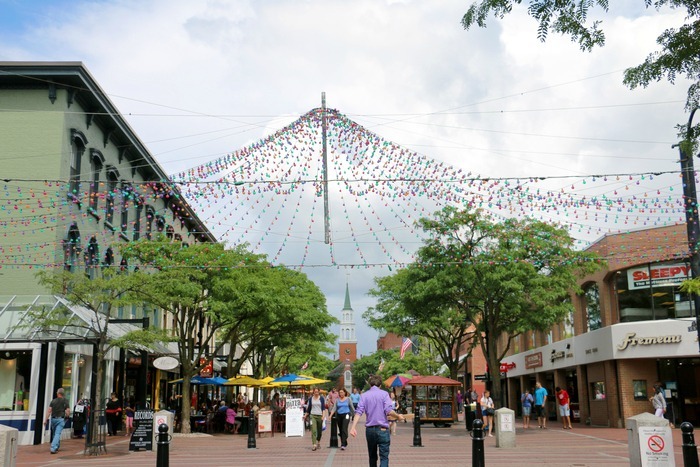 Before you plan your day trip to Burlington, be sure to check out the city’s array of festivals, events, trolley tours and concerts here. If you plan your visit for a Sunday, check out morning yoga in the street, proof that in Burlington – they’re takin’ it to the streets.